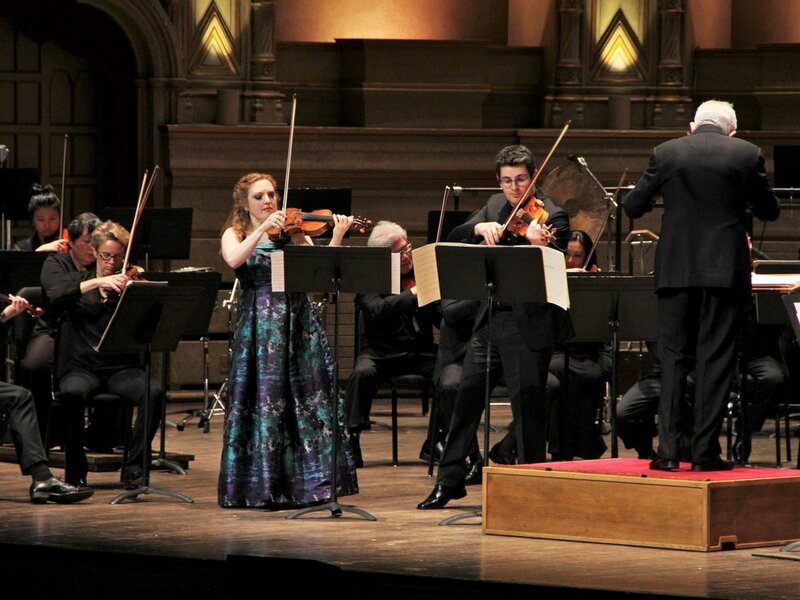 Rachel Barton Pine (violin) and soloists, Vancouver Symphony Orchestra, Bramwell Tovey (conductor); Pacific Baroque Orchestra, Alexander Weimann (director/harpsichord), Orpheum, Christ Church Cathedral, Annex, January 18-22, 2018. Each year the VSO New Music Festival has tried something different. One approach has been to focus proceedings around one world-renowned composer (Brett Dean) or ensemble (Kronos Quartet). Another has been to veer towards ‘crossover’ experiments and compositions with a certain trendiness or political empathy; still another direction has been to offer sort of a vast tasting menu of short North American works with few large compositions. All these approaches have merits, but the current festival, curated by the VSO’s Composer-In-Residence, Jocelyn Morlock, was unusually successful because it highlighted a number of distinguished soloists in concertante works and featured a mix of both homegrown and international composers. The soloists, led by estimable violinist Rachel Barton Pine, added real interest to the proceedings. The five concerts had considerable variety: the chamber music concert by the Standing Wave ensemble carried on from before but a successful two-concert cabaret event in the intimate Annex was added. It is the two bigger orchestral concerts under Maestro Tovey, and the innovative ‘New Music for Old Instruments’ (cosponsored with Early Music Vancouver), that are reviewed here. 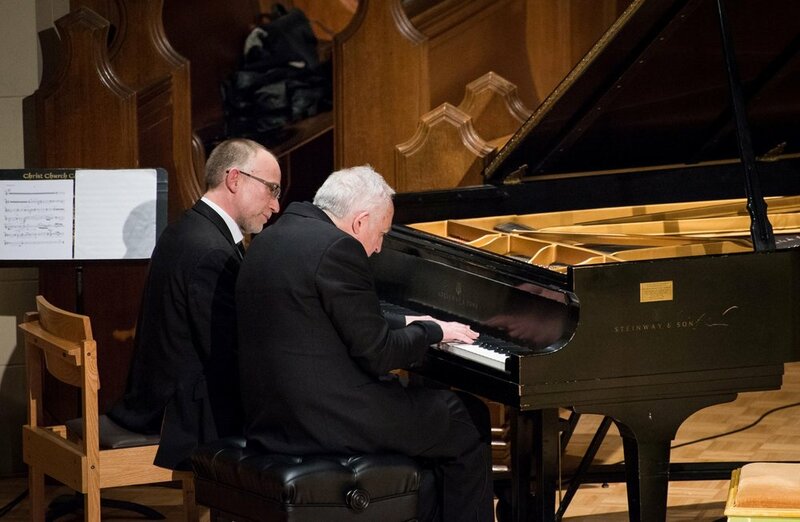 The festival’s success served as a wonderful parting gift to Bramwell Tovey, who initiated the VSO festival in 2014 after successes in Winnipeg previously. A touching moment came in the last concert when Morlock thanked the maestro for the great inspiration he has given countless young Canadian composers over the past quarter-century. Tovey was also honoured with the Barbara Pentland Lifetime Achievement Award, as presented by Sean Bickerton for the Canadian Music Centre (BC). The most skillfully crafted of the big concertos was John Estacio’s recently-written Trumpet Concerto, which will be played throughout Canada this year and was commissioned by no less than 19 Canadian orchestras. While employing standard neo-romantic orchestral devices from Korngold and beyond, its sharpness of focus and sense of dynamic contrast gave it a heady natural motion. The orchestral brass interjections were an important device in development and they intertwined with a well written and often searching solo trumpet part, played with virtuosity and admirable feeling by the VSO’s first trumpet Larry Knopp. Rhythms were always engaging, sometimes venturing to the jazzy side, and an overriding air of pleasantness took the long first movement home. The quieter Ballade introduced more wistful countenances, giving way to a finale full of jollity, with fully memorable melody and rhythmic bounce. I absolutely loved the catchy playfulness in this last movement, and the soloist and orchestra were fully up to the task of finding the joy in this piece. It is rare that the trumpet section of an orchestra receives so much attention at a festival but next evening’s big concerto was by Marcus Goddard, the VSO’s Composer-In-Association and Associate Principal Trumpet. This was his Violin Concerto written for Rachel Barton Pine, who gave it its world premiere at this concert. There could be few young violinists better suited to taking this work on and witnessing Barton Pine’s precision, and hearing her lovely clean tone, was almost an event in itself. There was ample feeling and space in the opening violin soliloquies and throughout the Elegy, but the orchestral development in the outer movements sometimes seemed on the generalized and heavy side, not quite meshing with the purity of the soloist’s feeling. The opening Allegro starts by alternating statements by the violin and orchestra rather than courting the richness of a direct integration of the voices while the syncopated rhythms and brass statements of the finale often took us towards the brightly-lit world of Khachaturian. That said, there were many fine dramatic touches en route, and many virtuoso challenges for the soloist and, not infrequently, the juxtaposition of styles did spring magic. Nonetheless, I have little doubt that the middle Elegy was the best movement: starting from a mood reminiscent of the Andante of Bartok’s Second Violin Concerto, Barton Pine found both compelling shades of wonder and remorse throughout, with some interesting uses of slides that were also echoed by the orchestra. Overall, a refreshing experience and a substantive achievement: it is not an easy task to write a 26 minute concerto. Moving to the concertante works for two violins, Anna Clyne’s Prince of Clouds (2012) definitely lived up to the reputation established when it was nominated for a Grammy award in 2015. Rachel Barton Pine and VSO concertmaster Nicolas Wright combined in violin parts which tend to imitate and reinforce each other. The key to the work’s development lies in the way a tender, yearning lyricism pushes out with feeling, to be regularly stopped by acerbic and bitter sforzandi, which create a contrasting unease. The virtue of the work is it consistency of design, coherence and its imagination in suggesting different violin styles and projections. Some of these are definitely folk, even hoe-down and ‘fiddle’; others neoclassical and sometimes romantic. For all one might detect American nostalgia at the opening (Copland), the work is really a historical journey through the British string divertimenti tradition. Thus, the piece sometimes hints at the parsimony and rhythmic thrust of Britten and the neoclassical discipline of pieces like the Sonata for Strings by William Walton, yet also mines the rhapsodic ardour and sensitivity of pieces like Vaughan Williams’ The Lark Ascending alongside. The raw sforzandi serve to stop one mode of expression abruptly but a new one is immediately born. 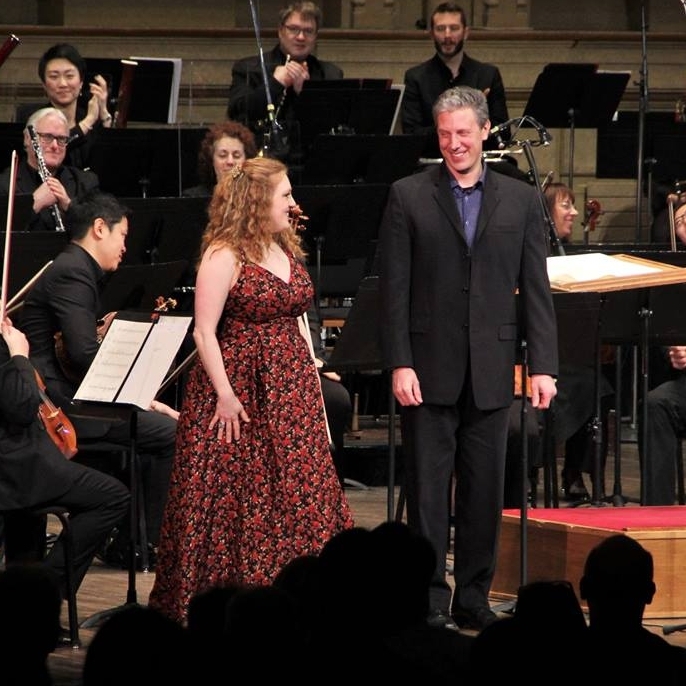 Artfully put together as a model of transformation and rebirth – as in the transformation of ‘clouds’ – the orchestra and soloists did fine justice to the work’s coherence and stature. In the second of the double concertos, Jocelyn Morlock’s Cobalt (2012), the two violins again imitate and reinforce each other, but the aim here is more about creating a sound world that distills the flickers of ambivalent feeling connected with an ‘atomic element’ that possesses an intoxicating and seductive colour but is otherwise radioactive and toxic. For all there are neoclassical intimations, Morlock’s sound world develops more as flow than structure, much as light builds, reflects and subsides when exposed from different angles, but there is always a feeling of anticipation and danger conveyed amidst the lyrical freedom. This is an impressive work in its ephemeral beauty and self-containment, and it comes out with intimacy and suspension in its chamber music version (CMC Centrediscs, 2014). The pianissimo pizzicato ending seemingly leaves everything unresolved – as many philosophical works are wont to do. I found the work bigger and more concerto-like in the orchestral version presented here, largely due to the presence of the sinewy lower strings. Hearing the complexity and density of these bottom lines made for an interesting balance with the violins, and I like the work in this form too – more burnished, less silvery but still shadowy. The final work with soloists featured a relatively relaxed but persuasive treatment of Schnittke’s eclectic Concerto Grosso No. 1. This was the ‘softer’ version for two flutes, and Christie Reside and Chris James played with fine style and sensitivity alongside the strings, harpsichord and piano. I am not sure that anyone intended the last concert to pay homage to Jean Sibelius, with an additional debt to the Sibelius Academy in the form of the transparent and beautifully-sculpted textures of Kaija Saariaho’s Ciel d’hiver. Nonetheless, in both Andrew Staniland’s Vast Machine and Sammy Mousa’s Nocturne, one thought many times of Sibelius’ adept ostinato and rhythmic symmetry, and his powerful, angular use of the brass in establishing musical architecture. Both of these works provided rhythmically-propulsive experiences of different types, but I think Mousa’s turned out to be the more emotionally gripping and sonically imaginative. Jocelyn Morlock’s latest contribution Night, Herself (the title inspired by an aria in Henry Purcell’s Fairy Queen) is a fairly complex and extended piece but it’s opening ‘chaconne’ actually took flight with the type of radiant, airy string and woodwind lines that one finds in Sibelius’ Sixth Symphony – utterly delightful. The work develops through a complex range of motion and instrumental density, eventually returning to Purcellian counterpoint at the end. The composition has both lyrical and structural appeal but some of this performance seemed too insistent: more care might be taken in delineating the transitions between the work’s different sections. I also think the Purcellian references might sometimes be mined with less drive and more piquancy and delight (pace Benjamin Britten). The mini-Morlock festival continued at this concert with her piece Revenant, a stimulating experiment to develop the famous ‘Royal Theme’ of The Musical Offering backwards before descending on the full glory of the theme played correctly at the end. Splendid work from flutist Soile Strakauskas, violinist Chloe Myers, and cellist Nathan Whitaker brought this piece to life, establishing a fluency in development while finding strong rhythmic momentum and surprising romantic ardour at points. The only place where I noted some turgidity was just before the Royal Theme reappears (in its correct form), where there might have been a more natural, and less academic, transition to this blaze of sunlight. Of course, in Bramwell Tovey’s last year with the VSO, no festival could be complete without one of his works. His just-completed Sinfonia Della Passione gave us tantalizing insight into how a composer who has often ventured in the direction of Bernstein and film music could also be infatuated with the sound of gut strings. As the work was designed to exploit the germinal cells of Brandenburg 5, one certainly noticed the Baroque harmonies, shifting chords and counterpoint to begin with. But the urgency of the string writing, combined with its fervent rhythmic insistence, made the overall experience more high-strung and dramatic; more like hearing a companion piece to Elgar’s Introduction and Allegro, as edited, say, by Philip Glass. The presence of quieter contrasting interludes – as led by the viola/ string quartet – fit very much within this British legacy, though many of these seemed to have a Wagnerian signature, one in particular reminding me of Siegfried Idyll. So very eclectic in its way, sometimes gripping, and a fine study of the variety of massed string textures possible with period instruments. All in all, a most enjoyable festival, and one that evinced a definite spark. There was a nice homegrown flavor to part of the proceedings, with a fine array of soloists participating with both orchestras in distinctive and contrasted works. I was genuinely impressed with size and range of the audience. Perhaps one could ask for little more in celebrating Bramwell Tovey’s farewell, and his devotion to this festival over the past 5 years.